Yesterday, my class of all boys and I had a rare and wonderful opportunity to take a video tour through the landmarks of Civil Rights Movement. No, not an online adventure, but an escorted adventure through the pictures & places Mr. Charles ("Tank") Duckett has been. Tank, a friend of Eagle Cove School and a guest to our classroom, shared his digital photo journal of his his trip to Civil Rights landmarks such as the Edmund Pettus Bridge, the Rosa Parks Library, Martin Luther King, Jr's home and grave site, Dexter Avenue Memorial Baptist Church, Little Rock's Central High, Fisk University....just to name a few! My boys heard for the first time the African American National Anthem, and they also got to hear Martin Luther King, Jr.'s 1964 Nobel Peace Prize winning acceptance speech. What's the correlation to Earth Day, you ask? It all got me thinking about parallels and connections. Tank was talking to my boys about how the Civil Rights Movement began with young people who were eager to take a stand and to take steps to move people forward. He spoke to them about coming together respectfully to be leaders, to build bridges. Powerful words to hear as a 3rd grader...more powerful too if they're taken to heart! Am I saying that the Environmental Movement rivals The Civil Rights Movement? Oh my word!! Heavens no! Not one bit!! What I am saying is that it is through people being committed to something greater than themselves that leaders are made. It is through small steps--backed by passion--that create change. From here, we are driven to progress. That IS the point of Earth Day...or any movement! "I refuse to accept the idea that man is mere flotsom and jetsom in the river of life, unable to influence the unfolding events which surround him." Perhaps it caught my attention because flotsom and jetsom are nautical word--words for environmental waste here a week from Earth Day. Words that describe what David de Rothschild of the Plastiki will most certainly find in the Great Pacific Garbage Patch. Yet more so, I was struck by the small similarity that we have a 40-year old environmental movement that was also started by few, scoffed at by many. Both movements were fueled by passion. Both movements have grown from the vision of people who are willing to stand up for what they believe in, to be out there, to do it step-sometimes-by-little-step. And then there are some, like David de Rothschild, who take bold risks. 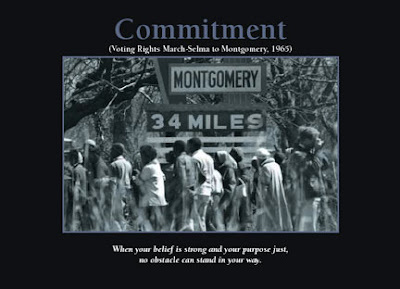 The Civil Rights Movement most certainly gained it's momentum by amazing men and women who took bold risks every day, risking their lives and sometimes their families' lives for equality, truth, and justice that were long over due...for a purpose greater than themselves. Both movement have grown from people who are willing to be true leaders, creating new leaders every day--often amongst the youngest out there. Returning to Earth Day, it was the brainstorm of John McConnell, and it started in the U.S. in 1970. Now it has evolved into an annual world-wide celebration to commemorate and concentrate on the Earth, doing all we can to maintain & improve the health of our planet. From the first Earth Day April 22, 1970, the movement gained momentum in that the Clean Air Act was written to address air pollution (and was later rewritten in 1990) and Congress created the EPA (Environmental Protection Agency). Given the enormous activism of the 1960's and the Civil Rights Movement, perhaps it was only natural that other issues (including the environment) started becoming focal points for change as well. To visit Mr. Duckett's website, click the link above or go to http://charlesrduckettandassociates.com/ . To see the lyrics & hear the music for the Black National Anthem "Lift Ev'ry Voice & Sing," go to http://www.black-network.com/anthem.htm . To join the "Earth Day 2010 Campaign: Billion Acts of Green," go to http://www.earthday.org/ . Picture from http://www.artisanartsonline.com/product_info.php/cPath/312/products_id/3007 and shared today by Mr. Duckett. The quote: "When your belief is strong and your purpose just, no obstacle can stand in your way." Good advice regardless your mission.